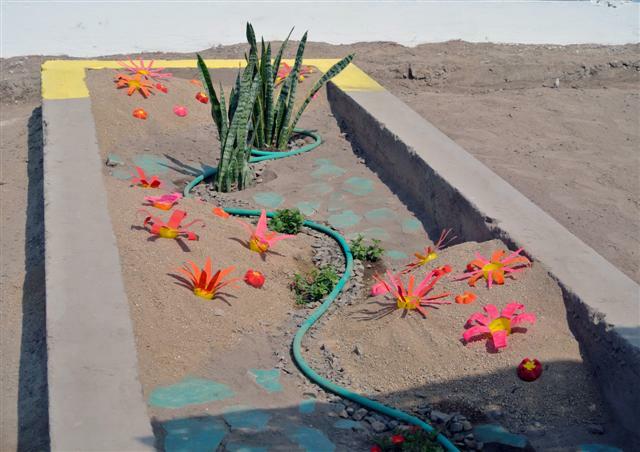 Due to the limited water resources in Metropolitan Lima and inefficiency in their use, a new approach to urban planning is needed that combines a conceptual strategy based on the flows of water and the provision of ecosystem services. 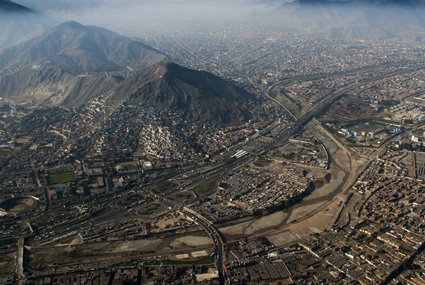 For this reason the work package 9 (WP9) aims to develop landscape and urban planning tools and design tools leading to water sensitive land use management, considering the uncontrolled urban growth and limited water resources in the metropolitan area of Lima and Callao. New planning and design tools are required to establish a functional spatial framework to link urban development with the consideration of optimized water use. 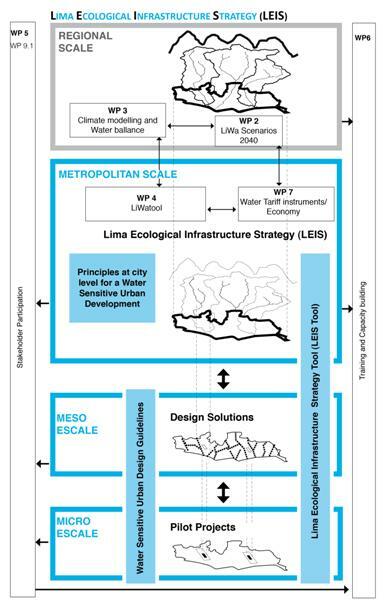 Building upon the existing scientific and practical knowledge of water sensitive urban design (WSUD) and the concept of Green Infrastructure adapted to the arid climate conditions, the Lima Ecological Infrastructure Strategy (LEIS) is being developed. Its aim is to provide guiding principles for multifunctional open space planning and design to proactively contribute to improvement and protection of urban water cycle. The ecological infrastructure can be described as a multifunctional system of open spaces that, due to its multiple functions serves as integral urban structure providing essential infrastructural services. It is assumed that the coordinated designation of multifunctional open spaces as proposed in the ecological infrastructure strategy tackles the urban development challenges in a more efficient way than conventional land use planning approaches. Therefore it can guide the urban development in a more sustainable way. The Lima Ecological Infrastructure Strategy (LEIS) is developed and documented in three main LEIS products: Principles, Tool and Manual. 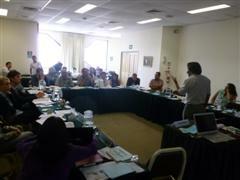 Thus the LEIS Principles are based on a participatory process as part of the Lima metropolitan urban development strategy, different workshops with key actors took place with the aim to identify the LEIS-principles that could respond to the different negative processes happening in the metropolitan area related to landscape and urban development and water and wastewater management. Through that process the LEIS Principles are developed as a set of rules for water sensitive urban development based in a multifunctional open space system that considers the integral management of water and wastewater that contributes closing the urban water cycle in the city. 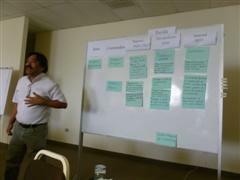 After defining the principles is needed the identification of Where to develop the ecological infrastructure. Therefore, the LEIS-tool serves as a GIS-based planning and quantification tool, which supports the establishment of the layout and assessment functions of the ecological infrastructure as described in the LEIS-principles. It estimates water-related impacts of urban growth and quantifies assumptions on water demand and water re-use potentials of design solution test cases. The third main output of WP9 is the LEIS-manual, which is a conceptual design tool with a set of water sensitive urban design measures guiding the design process of green areas towards development of water-sensitive green spaces. The work package deals with various scales. On the metropolitan level, principles for ecological infrastructure are defined and harmonized with the Concerted Regional Development Plan, developed by the Metropolitan Planning Institute (IMP), project partner of WP9. These principles will be considered in the future Metropolitan Urban Development Plan that will guide the District urban development plans promoting the implementation of the ecological infrastructure at major scale. 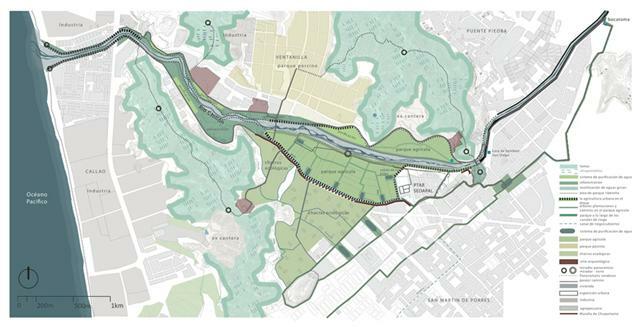 Likewise the application of the principles was exemplified in the Landscape Development Plan for the Lower Chillón River Valley. The GIS-based LEIS-Tool is covering all planning scales and analyzes the different (water-related) dimensions of metropolitan Lima. As shown in the graphic below the green inventory can be used to calculate the actual water consumption of the green spaces in Lima. Depending on the level of implementation of water sensitive design solutions the potential for water saving can be estimated. On the site level, water sensitive urban design measures for open space design were developed. Analyses of several existing open spaces and new design projects show how water sources and vegetation are dealt with in the open space design. The aesthetics of the water bodies and water infrastructure are also analyzed, in addition to social aspects and management and institutional frameworks. Based on this study water sensitive urban design measures for different water sources in different spatial situations is presented and tested as part of academic projects and summer schools in cooperation with the LiWa-Partner Ostfalia and Peruvian Universities. 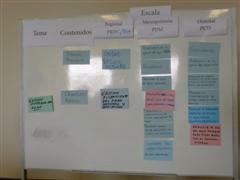 As well as through the development of the pilot project “Ecological River Park Chuquitanta”. Developed at various stages in Lima and the University of Stuttgart creating a multifunctional corridor space over the river bench that acts as an ecological water treatment facility from various water sources and also as flood protection area during rainy season in the upper watershed. Thus different areas has been defined for urban agriculture, recreation, leisure and culture connecting the cultural landscapes with the existing cultural heritage. The LEIS Manual design tool supports the integration of water sensitive urban design measures into the design process of green areas. It supports the identification of the water source, estimation of water demand of the design proposal, selection of irrigation system, selection of low-cost and environmental water and wastewater treatment technology and estimation of the space required for the technology, conceptual design solutions for integration of the technology and the open space design. Application of the measures is leading to development of new types of green spaces, for example: dry parks, river purification parks, irrigation channel purification parks, and wastewater treatment parks, fog harvesting parks, etc. A system of such water-sensitive open spaces creates an innovative multifunctional system of urban infrastructure – the ecological infrastructure. A comparison of water consumptions between the current design practices of open spaces and the water-sensitive approach will demonstrate the impact of the ecological infrastructure on the water flows.